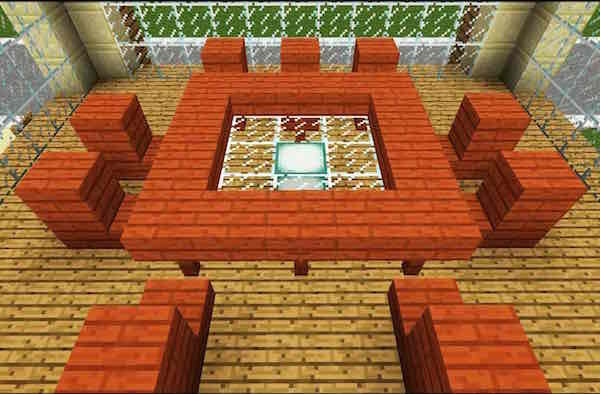 Find awesome Minecraft Furniture ideas here including a gallery to help you feel inspired. Using different Minecraft furniture in your builds can add some extra flair to the game, especially working with such limited materials. It’s fun when you actually decorate each room even if the design is not functional. Instead of creating just plain homes for your villages, going a bit bigger and better and spicing things up with cute Minecraft furniture is the way to go. I include photos and some videos on different furniture styles for different rooms like the bedroom, dining and living room, bathroom, or the kitchen. I also include outdoor furniture which has styles for things like an outdoor decorative mailbox, as well as Entertainment furniture. That includes something like a decorative piano or pool table. Each of the categories below contains a gallery of unique ways to decorate your builds with furniture ideas that make your Minecraft buildings a bit more stylish and unique. For some like myself, it adds a whole new dimension to the game. I really personally like to have everything looking pretty and stylish and just visually pleasing. Its apart of the Minecraft charm, making something that looks good even though you are working with such simple materials. Dining and living room furniture contains how to’s and a gallery of items like sitting chair, couch, and table styles. Bedroom Furniture contains items like bed, dresser, and closet styles for your Minecraft bedrooms. Our Minecraft bunkbed ideas are particularly fun. Bathroom furniture includes styles for bathrooms as well as different toilet looks, sinks, and tubs/showers. Entertainment furniture is how you can use Minecraft items to make something look like a television set, as well as other random stuff like an easily re-creatable pool table or piano. Find styles for your cabinets, a few different fridge options, as well as how to make a cute looking stove or countertop designs. Outdoor furniture gallery has it all including patio sets, a mailbox for your house, and other random items. Check out each category and the gallery it holds for awesome ideas to add extra swagger to your rooms. Whether your decorating your living room, great room, basement, cellar, or Stronghold, our designs will keep you busy.